This is a fabulous one-of-a-kind, spacious, 2 bedroom, 2 1/2 bath, penthouse located in prestigious El Escorial Villas. It is one of a few condos with a full 2-car garage. This special architectural design features an open floor plan with a living room with high ceilings and a warm fireplace, a remodeled kitchen and a formal dining room. Each bedroom has a private bath and a large organized closet and the master bedroom has a cozy fireplace. The large master bath has been beautifully remodeled with granite throughout. The spacious deck, overlooking the beautiful El Escorial pool, is surrounded by tropical greenery and is accessible from the living room and master bedroom.There is a spiral staircase to a loft over the living room with a door to a private rooftop deck with spectacular mountain views; a fabulous place for your morning coffee and for sunset views with a glass of wine. 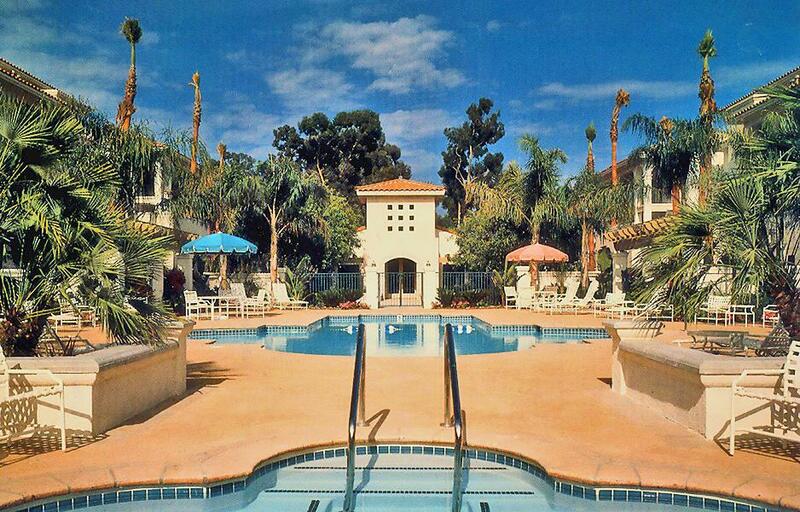 This property is in a resort-like setting with a beautiful pool and spa, health club, clubhouse, tennis courts and is gated with 24-hour security. El Escorial Villas is located across from East Beach, next to the zoo, near Montecito's Coast Village Road with trendy shops and restaurants and within easy access to beautiful downtown Santa Barbara.